Insurance claim denied? Look no further? The team here at Goldfinger Law has been handling long term disability claims since we opened our doors. We know that it's not fair that you've been paying premiums to insurers for years only yo have your claim for benefits denied for no apparent reason, or because of a technicality. If it's justice you're seeking, along with compensation for your benefits and damages for your anguish based on the denial, we're the law firm for you. You expect to get treated with respect, courtesy and have your claim taken seriously. Unfortunately, some insurance companies don't see it that way. Your case is put to the bottom of their pile, and not given the attention which it rightfully deserves. Getting that claim approved will help you feed your family, pay your bills, pay your mortgage. Why should you be left without any money coming in because you can't work but are supposed to be protected by disability insurance? Having your case sit there an on adjuster's desk and not moving in the right direction can have devastating financial consequences on you and your family. Not to mention the anxiety, stress and depression which comes with being in pain, not working and having no source of income. That's not fair and doesn't sit right with anybody at our office. Whether you've been hurt or injured at work, in an accident, or your problems are physical or psychological and they have arisen over time; our team can help you win your case. 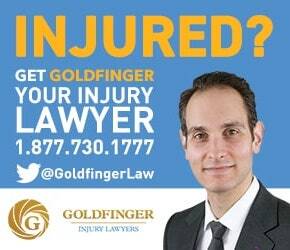 Retaining Goldfinger Injury Lawyers will give you the peace of mind that your interests are protected. We will help you get the results which you deserve and restore dignity to your life. Let's get that claim approved together. Our personal injury lawyers have helped countless long term disability claimants and their families get the benefits which they deserve. We have assisted our clients recover from such companies as Great West Life, SunLife, Manulife, Desjardins, RBC, Industrial Alliance, Canada Life, London Life, TD Meloche Monnex, Pacific Life, BMO, ACE, Primmum, Portage La Prairie, Aetna, Gore Mutual, Prairie Mutual, Allstate, Co-operators, Farmers Mutual, SSQ, MetLife, Scottish & York, CUMIS, Brant Mutual, Chubb and others. If you don't see your LTD insurer on this list, we're confident that we have likely dealt with them in the past as these companies are constantly amalgamating, changing names or restructuring. There are many ways we see people ruin their LTD cases before they even have a chance to get off the ground. Your adjuster will likely want you, your doctor and your employer to complete a variety of forms. The adjuster may even come to your home, come to your workplace, or send you to one of their "*specialists*" for a medical assessment. Don't get hurt twice. Call Goldfinger Injury Lawyers before the insurer has a chance to take advantage of you. By the way: those medical assessments which the insurer requires that you attend aren't so independent. Call us and we will explain to you how they really work. Some of the common claims we have seen include chronic pain, depression, anxiety, fibromyalgia, back pain, disc bulges, infections, broken bones, fractures, brain injury, adjustment disorders, mood disorders and other physical and psychological ailments. We have a network of medico-legal experts to help you get the best possible result for your lawsuit. We will also help you apply for other sources of income while your claim is being litigated so that you have some money to make ends meet. We also know various treatment providers who may agree to provide you treatment and get paid at the end of the case. There are many pieces of information which large insurers won't share with you. You literally need a fine tooth comb to sift through all of the information available in your LTD case to get the answers you need. Fortunately, retaining Goldfinger Law can help you get those answers quickly so that you can have a better understanding and be in a better position for the duration of your lawsuit. Insurers have a duty to handle your claim, and treat you with the utmost good faith. If they fail to do so, our team will find out and bring a claim against them for bad faith damages, damages for mental distress along with punitive damages. Because we've handled so many LTD cases, it becomes abundantly clear to us when an insurance company handles a claim in bad faith. We make sure that the insurer and the adjuster pay for their mistakes so that you come out on top. If you've never retained a lawyer before, it's easy to do. All of our consultations are free.As with all of our cases, our lawyers will not charge you any legal fees until you case has settled. The last thing we want is for you to worry about paying legal bills when you have other more pressing bills to take care of. We know that your family, and your well being are top priorities. We want to take all of the pressure, angst, and worry out of your case. We tell all of our clients that their biggest job is to focus on their individual wellness and rehabilitation. Let us take care of all the rest. This means that it's your responsibility to attend at all medical, specialist and treatment appointments. We want you to get back to work and get better. We tell people that it's best that they have great and enjoyable lives, and terrible legal cases; rather than painful and miserable lives and perhaps better cases because their health is so bad. Our offices are located in Toronto, London and Peterborough. We represent people from all across Ontario. If you can't make it to one of our three offices, we would be pleased to come out and meet with you personally. If you or a loved one has a long term disability claim which has been denied, call Goldfinger Law for your free consultation today. We would be pleased to help you as best we can.